Spring Edition of the Ispeak Newsletter, Check it Out! 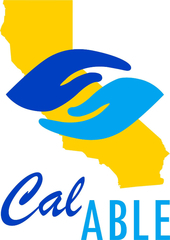 CalABLE is a tax-advantaged savings program for people with disabilities. A CalAble account allows anyone who became disabled before age 26 to save up to $15,000 a year without having that money count against the $2,000 asset limit for means-tested programs like SSI and Medicaid. In the last year we have been busy in Sacramento creating and pushing thru bills to help people with disabilities to have a CalAble account, to also save for their future. We have gotten bills passed so Medi-cal cannot recover funds from the account. Also passed was a bill that the CalABLE accounts are a federal program, so everyone in the United States who is eligible can access to this program, which make a larger pool, which in turn lowers the admin fees. Now we are working on a bill that makes it easy for a person to make tax deductible donations into the account. Right now the CalABLE account has a limit of $100,000, so we would like to see this limit raised, or that you are allowed to have multiple CalABLE accounts. Currently the CalAble Team is working with vendors to work out who will run and administer this program for California. This provides people with disabilities the foundation to save money for their future, and medical expenses. Please welcome The Simple Dollar to our listing of Special Needs Resources Listing. Did you know research found that most people who have become or already living with disabilities are not fully aware of the benefits and resources that are available to them. This guide will not only answer common questions like qualifications, but also the application process, as well as it provides a calculator that can help estimate monthly and annual benefits. Please find their information and website details on the Neglia Collaboration Special Needs Resource Listing. Check out the website Tyler built for his Ice Hockey Team, the SDIA Midgets! He keeps the roster, schedule and also the scores. I take photos and film each of the games, and he edits and creates the media and videos for his website. Tyler is also taking courses to be an apprentice Ice Hockey coach. He has already passed his first online course. Never stop learning! During the past year in school Tyler worked at both the Coffee Shop at School, and also at CVS. These new jobs, helped him build confidence, learn new skills, and work with different people. Now Summer is upon us, I asked Tyler what he was going to do for a summer job. In his Work Experience class at school they helped him create a resume. So we reviewed it, as I told him he should walk to our village (10 minute walk) and look for a job, like any other teenager does over summer. Well he went into a burger restaurant, and they told him to come back and complete a job application. He did this, by himself! Then they asked him to come back and participate in two training sessions. Then after the training, he was told he had a job! This is the first real paying job, Tyler has ever had, and he did it completely by himself. He learned to push himself outside his boundaries, and is so proud of himself. He will learn so much from this experience. Tyler has been busy working in my mother’s ceramics studio. He has made his own line of ceramics, and shown it at various art shows. He had sold out of all his pieces, so he just made a fresh supply of new ceramic giftware. He has also built the website for clay2go and the Facebook site. As my son Tyler is 16, I am trying to teach him to be more independent. I am pulling back, and trying not to help him as much with daily chores, activities, homework, study, etc. Working with the Orientation and Mobility Specialist at school we have been working on Tyler safely walking to his grandmother’s house by himself. Well today he did! He crossed busy streets, and walked safely to her house! He was very proud of himself. It is important that our special children learn to be independent! All these small steps to independence add up!